What is REMIT? Who is influenced by REMIT? REMIT is applicable for any energy market participant; it means natural or legal person; who enters into transactions, including the placing of orders to trade, in one or more wholesale energy markets. As the most significant impact should be considered the trade and fundamental data reporting obligations related to any wholesale energy products. More information you find at REMIT sub-page. Who is a market participant subject to reporting obligations? Electricity and narural gas wholesales traders or suppliers. Eletricity and gas transmission system operators, storage system operators and LNG facility operators. Electricity producers with a single or combined production unit with a capacity more than 10 MW. Natural gas producers with a single production facility with a production capacity more than 20 MW. Energy consumers with individual plants under the control of a single economic entity that have a consumption capacity of more than 600 GWh per year. When is required to start with reporting of individual transactions? 7 October 2015 – the obligation to start with reporting of orders and transactions related to the standard contracts realized at the organized market places. In the same time all outstanding standard contracts concluded on the organised market places before this date has to be reported within 90 days to the Agency. 7 April 2016 – the obligation to start with reporting of orders and transactions related to the standard and non-standard contracts concluded at the organized market places as well out of the organized markets, electricity and natural gas transmission contracts and also respective fundamental data. In the same time all outstanding transactions concluded before this date and still valid has to be reported within 90 days to the Agency. Note: A list of standard contracts at respective organized market places you could find at https://www.acer-remit.eu/portal/standardised-contract. What are deadlines for reporting of the individual transactions? Details of standard contracts and orders to trade shall be reported as soon as possible but no later than on the working day following the conclusion of the contract or placement of the order. Details of non-standard contracts including any modification or the termination of the contract and transactions shall be reported no later than one month following the conclusion, modification or termination of the contract. What is a role of Solien in REMIT reporting process? What is RRM? RRM (Registered Reporting Mechanism) is an entity being entitled to report trade and/or fundamental data directly to ACER. Only registered RRM can report requested data under the REMIT. Company Solien is an independent RRM complying with all technical and organizational requirements for the data reporting and is registered by ACER. Any wholesales energy market participant can fullfill its REMIT obligation by our services. What are the advantages for market participants by using Solien services as the independent RRM? Solien as the independent RRM undertakes to comply with all technical and organisational requirements on ACER communication. Solien undertakes to meet all report format requirements and data generation depending on type of provided service. Full control on reporting process by using a user-friendly, efficient and secure REMIT reporting tool. Usage of tool updated, reflecting all legislative and technical changes and proving the REMIT obligation fulfilment. Does Solien provide REMIT reporting services only for standard contracts or also for non-standard contracts? Respectively concluded on organized market places or out for them, OTC trades, etc.? Solien provides an ability to meet REMIT reporting obligations for all types of contracts; i.e. standard, non-standard contracts and concluded on organized market places as well as out of them. In the same time we intend to provide reporting of the fundamental data service. 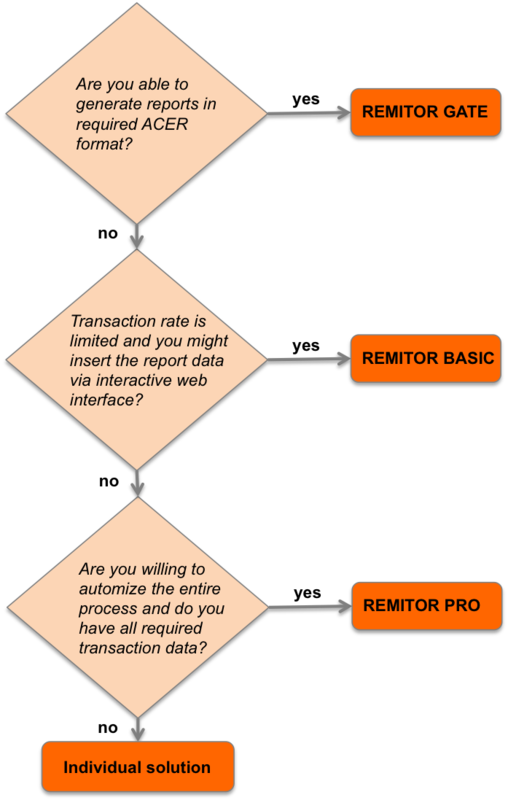 How to choose the product provided by REMITOR platform? Which kind of service is most suitable for my kind of business? Do you know to generate reports in a format required by ACER? If yes, as the most suitable and efficient products is REMITOR GATE. If not, is transaction rate limited and are you able and willing to insert the data via web interface? For such case REMITOR BASIC is dedicated and using the interactive web interface for client’s account where to create, process, modify your reports is very simple. If the transaction rate is higher do you know automatically generate and submit required data / data fields in a standardized form (xls, xml, etc.) via set interface? REMITOR PRO arranges the entire reporting process automatically. If also this not your case and do you need a transferring of your data format to the REMIT format, alternatively add some missing data? In such case the individual solution is needed including specific data mapping. In such case Solien makes a data analysis and propose the solution where the reporting process will be successfully meet without redundant costs. How to become a client and start to use of services related to REMIT reporting obligations? Sign a service agreement on providing the REMIT reporting services with Solien, where you choose the service type. As an integral part of such agreement are authorizations of individual persons being entitled access the system on behalf the client. Authorize Solien as RRM being entitle report on your behalf and include our ACER code into the CEREMP system. You get the access credentials and reporting can start. What about general terms and conditions for respective services and respective fees? For general terms and conditions as well as related fees please contact us. Are you planning to provide training or testing environment? In a customer zone there are user manual, information security rules, recommendations as well as tips for the most efficient usage. In the same time we intend to provide the testing environment also for clients, where individual functionalities could be tested.